Today is me and Jen's wedding anniversary. That meant that last night I figured I'd try to make a nice meal. The only problem was that I had worked every day for the past eight days and didn't get home until about 7:30 PM. It was the first food I'd cooked in over a week so even though it was a little rushed and not exactly what I wanted it felt good to get back into the kitchen. Today, in a repeat of our wedding day, the temperatures are creeping into the mid 90's so we're planning dinner out to avoid sweating in a hot kitchen. 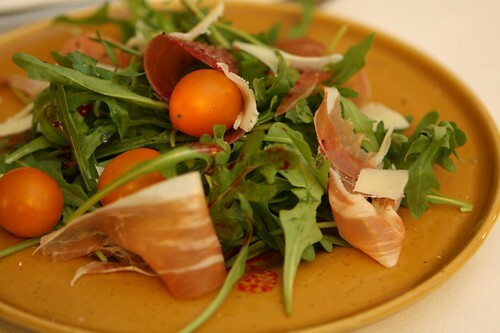 For salad I used some remaining arugula from Satur Farms, some La Quercia prosciutto, and shaved Gruyere. Instead of the same old balsamic glaze I squeezed some cactus pear juice over the salad and drizzled a little olive oil before sprinkling with salt and pepper. Truth be told I had never actually used a cactus pear before. I was planning on serving it sliced over the salad but after dissecting one and finding it full of tiny, rock-hard seeds I opted to use just the juice. 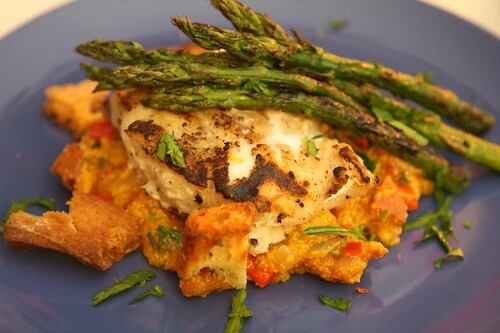 I fired up the grill and threw on some tilefish that I'd seasoned with salt, pepper, and olive oil. I also grilled asparagus with the same seasoning. Once the fish was marked up nicely I threw it in the oven with some torn off pieces of day old sperlonga tossed in olive oil and roasted them all together in the oven. On the stovetop I sweated some onion, red pepper, garlic, and chorizo then added some corn grits, salt and pepper, and water. Before serving I stirred in some parsley. I went to our local wine shop to pick up a bottle of rose for dinner only to find that they were closed for a private party. The party goers pretended to ignore me a I fogged up the window with my breath. My breath and my rage. 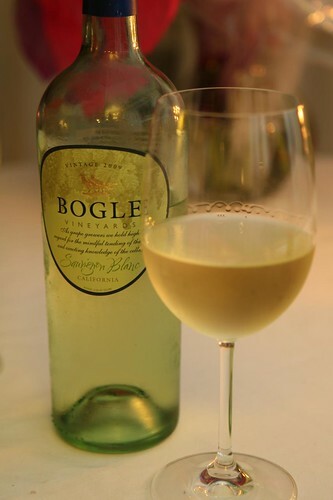 With no rose I was forced to chill the last remaining bottle of white we had in the rack, this bottle of sauvignon blanc from Bogle Winery. This wine has a very serious label design and a very silly name. I confess that it was the silly name that drew me to it. While the wine was very tasty I was sad to not have been able to provide Jen with a glass of rose for this meal.